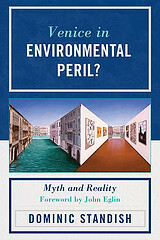 Elisabetta Gasparoni has written a very perceptive and thorough review of my book Venice in Environmental Peril? Myth and Reality (UPA, 2012). You cannot help but wonder how the ancient Venetians managed to create such stunning architecture and, what’s more, to do so in such hostile conditions. The city stands as a majestic symbol of human mastery over nature. In the past 40 years, however, claims that the Venice is endangered by rising sea levels and swamped by tourists have helped create the image of a city in peril. The academic and long term Venice resident Dominic Standish questions those claims. Venice in Environmental Peril? Myth and Reality offers compelling evidence to disprove the arguments that Venice is in peril as a result of rising sea levels, the destructive impact of tourism, or from modern development. Venetians, says Standish, have been discussing the causes of floods for centuries. However, what has changed in recent years is the Western self-understanding of its achievements in relation to modernity. As a result of contemporary discomfort over mankind’s attempts to master nature, the debate about how to protect Venice from its harsh environment now takes place within a very different framework to that which existed previously where human endeavour tended to be celebrated rather than frowned upon. During the Serenissima – the period from the late 7th century up until 1797 when Venice was known Most Serene Republic of Venice – poorly developed infrastructure, weak building structures, and the absence of sea walls meant that Venetian communities were left open to devastation through flooding. Despite experiencing devastating floods and environmental disasters, the ancient Venetians aimed to curb environmental hazards. The ambition of dominating the seas was celebrated through the formulation of rituals, ceremonies and myths. Today, Standish notes, myths are still devised. But now these are less directed at exerting control over natural adversities as much as to emphasise human fallibility. The now famous floods of 1966 played a key role in defining the contemporary image of Venice in peril. These floods were certainly severe, and indeed were exceptional in terms of the past century. Yet there is evidence to suggest that much more devastating floods have occurred in Venice’s long history. However, the response from national and international players to the 1966 floods went far beyond a technical response aimed at addressing the particular practical consequences of the floods. Rather, as Standish notes, the reaction of the various players helped construct the city’s problems of flooding and sinking as a moral problem, persuading audiences to accept that Venice was a unique problem worthy of political interest. The incident was used somewhat cynically as a means of raising the profile of UNESCO. However, over the years that followed, the legacy of the floods has also served to hinder the project of creating mobile dams to protect Venice – a project which in reality offered the best practical solution to Venice’s environmental predicament. So how threatened is Venice by environmental factors such as rising sea levels? Standish explains that ‘high-water events’ are caused by a variety of inter-related factors which include physical changes to the lagoon. For example, the extraction of ground water from aquifers beneath the lagoon itself and the extraction of methane gas from under the Adriatic Sea have both caused irregular subsidence. Rising sea levels and the local weather must be also considered. The floods of 1966 were the product of bad weather along with an earth tremor on the Adriatic Sea bed which contrived to create water levels that were nearly two meters higher than usual. But did the floods justify defining the Venice ‘problem’ as unique? In fact in objective terms, the impact of the 1966 floods was much greater in other parts of Italy. For example, whereas the official final death toll across northern and central Italy was 110 people, there were no flood-related deaths in Venice’s historical centre. And while after more than a month of rain in Florence, 90 people died due to the onslaught of high rivers, nevertheless Venice attracted greater attention. We could conclude that the 1966 floods were a key moment in Venice’s history not because of the floods per se. Rather, it was the reaction to the floods that was important in helping create a shift in perception as to the relationship between Venice and the environment. In particular, they were important because they became central to the myth of Venice’s vulnerability. Decay was already an emergent theme before 1797. However, in the aftermath of the fall of the Republic and the capitulation of the city to French and then Austrian rule, it was vulnerability that became the symbolic representation of Venice. Rather than the image of triumphant and arrogant conqueror of the seas that was associated with Venice during the era of the great Republic, during the 19th century it was the cultural themes of decadence, frailty and death that came to represent Venice. The fallen Republic fascinated many in Europe and the New World, provoking operas, paintings, plays, poems and novels. According to Standish, these cultural scripts have helped inform the view of a city as vulnerable to its watery environment. For most of the thousand years of the Venetian Republic, the overriding concern was for development rather conservation. The ancient Venetians predominantly built and remade their city through demolition, rebuilding, and interventions that aimed to curb nature’s impact. After the end of the Republic, the notion of restoration became popular. However, this concept retained an active belief in the benefits of updating buildings. The tension between conservation and modernization grew significantly in the 1870s when the Englishman John Ruskin appealed to critics of modernization around Europe in the hope of promoting a conservationist outlook within the city. And after Italy industrialised in the early twentieth century, the perception – in some quarters at least – was that Venice was threatened by modernization. In the period since then, wide ranging conservationist laws have been created, with the result that today, over 95 percent of buildings in Venice are listed historical monuments. One of great benefits of this book is the attention Standish pays to tracing the changing ideas informing the outlook of the conservation and environmental movements in late 20th century Italy. He reveals how the two movements gradually developed closer links in the period after the radical uprisings of the late 1960s and early 1970s. Radical environmentalism could be said to have emerged in the aftermath of the collapse of civil rights movements in Europe and the USA, when the result of disillusion over the failure to realise the social ambitions of the 1968 student movements was that issues such as the environment came more into focus. In the 1970s, however, in keeping with their different traditions, environmentalists and conservationists continued to frame the Venice problem very differently. The former were still keen to protect buildings and monuments, while the latter’s outlook was conditioned by the belief that capitalism was responsible for the unrestrained waste of natural resources. The movements eventually converged over the nuclear issue at the end of the 80s. The anti-nuclear campaign with its broadly-defined frame of reference as peace and natural equilibrium proved attractive to both conservationists and environmentalists. Standish illustrates well how the environmental problem was reframed with an emphasis on integrating nature and society. Importantly, it eventually signalled the arrival of environmentalism at the centre of the Italian political debate as, in 1996, the Green Party entered national government for the first time. As a result of their gaining control of the Environment Ministry, the Green Party was able to block progress on Venice’s mobile dam project until 2001. Venice in Environmental Peril? provides a convincing explanation as to why the environmentalists challenged the provision of mobile dams. Standish points to the Green’s adherence to minimal forms of intervention. These were attractive because they appeared to hold the possibility of integrating natural, social and historical factors, and were therefore favoured over ambitious engineering projects that could transform the natural world to human advantage. The environmentalist proposals were based on a belief that putting nature and conservation first would benefit the environment. However, when the solutions are analysed, it becomes clear that the proposals are actually very inefficient. In itself, the development of this set of arguments ensures that Venice in Environmental Peril? is a useful contribution to the debate. However, rather than leave the book as purely critique, Standish concludes with an interesting ten-point proposal which argues the case for a form of modernization that puts people and their needs first, but which also enables conservation of heritage, and improves the environment in the long term. I would thoroughly recommend this book for the excellent critique it provides of the contemporary concerns and preoccupations of environmentalism. It represents a powerful response to the perception of Venice in peril, with a message that is loud and clear: the real danger humanity faces is the sinking of ambition, courage and resilience. Hi Dominic, I have recommended you book to our Architecture Librarian (I work at the University of Auckland) I thought you might be interested to know she intends to purchase it for the collection.